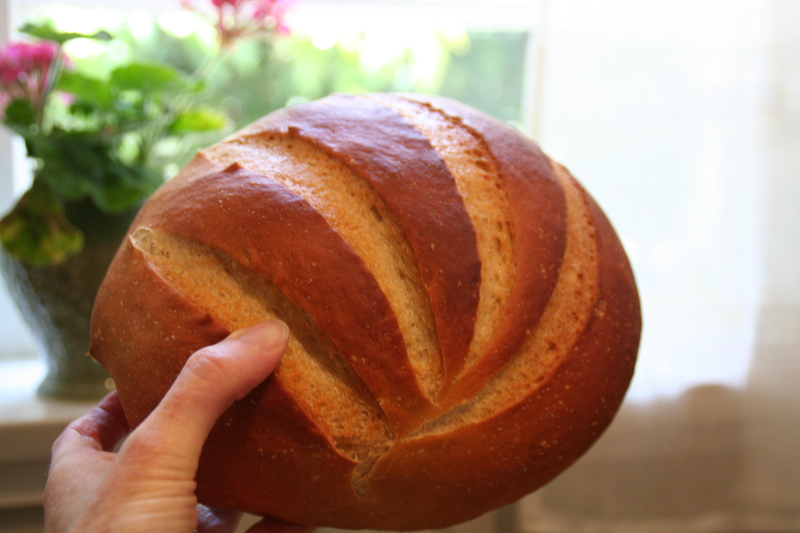 Recently I posted an open letter to prosphora bakers, asking for their help in uncovering some of the secrets of making the perfect loaf of bread for church. The discussion ran from the original post, to a stream of comments on Facebook, to a final landing place of photos on my own Facebook page. All of this was amidst a whole day of trial baking–nine loaves in all–four batches of bread–and the hopes that I might continue my learning and better my baking. And I think what I learned most didn’t have to do with baking at all. It’s what I already knew–what I’ll always know. This kind of work, this kind of act–something destined not only for myself, but for others too, is ALL a gift. The mixing, the kneading, the prayers, the way the house fills with smells from the oven, the way the bread travels with me, from my home, to the church, to the altar… Christ makes his home in that bread, just as he makes his home in our hearts–and that eucharistic bread is changed for us–a holy gift to us, reaching from mouth, to stomach, to our hearts. All gift. So who cares if a few of the loaves split on the sides? Who cares if a few even split across the top? Three good ones, that’s all Father Nicholas really needs, and the rest, if it comes out well, is simply bonus bread. All gift. 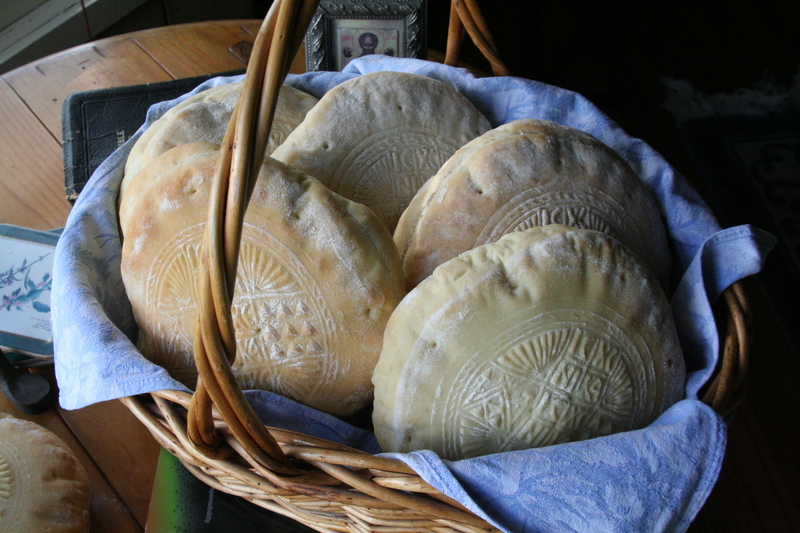 If you bake prosphora, I encourage you to enjoy each and every moment of that process. If a loaf or two come out lame, God doesn’t care, and chances are, your priest won’t either. You offer what you can and leave it at that–proceed from the kitchen to then love those around you, and leave a little more learning for the next time. My parents have moved to Santa Barbara and it’s the first time since I was eighteen that I’ve been this blessed to have these two generous and interesting people so nearby! My mom marvels at the fact that I make jams, sew Dr Seuss shorts, and bake bread, while I marvel at the fact that she can do a crossword puzzle in about five minutes flat. She’s a whiz. The other day, because she says she wants to learn some new hobbies (she’s also taking calligraphy from Carla! 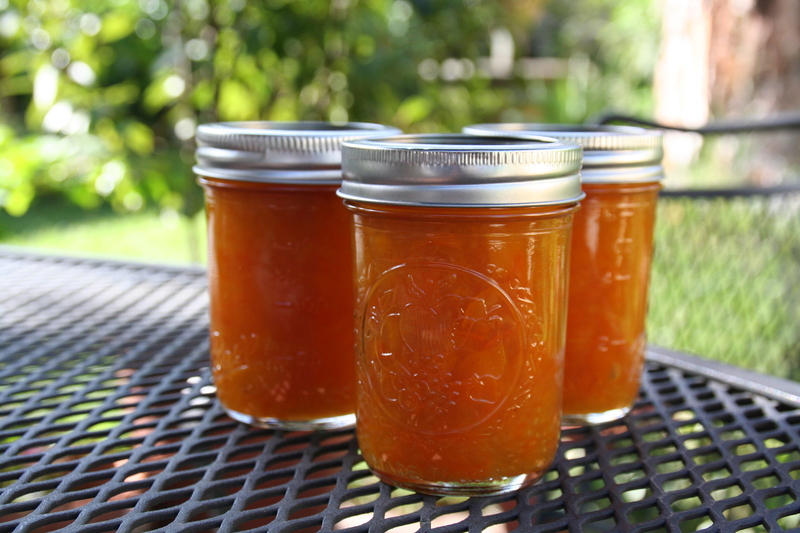 ), she came over and we tackled another batch of homemade kumquat marmalade together. Back up. We have a lovely, healthy kumquat tree in our front yard, and some years it fruits like crazy, but this year. 😦 hmmm. Nothing. So, for the second time this season I raided my neighbor’s tree. They don’t like kumquats. (Are they crazy?!!!) And I do. I set my mom to de-seeding, while I flipped between subtraction problems with John Ronan, the laundry, and chopping cut kumquats. She’s a worker, that mom of mine. Five cups of chopped kumquat later, a cup of local honey and a bit of water and we raced to shut the doors to keep out the bees. Bees seem to know where the honey is, I’ve found, and don’t mind trying to get back that which we sneak from their hives. I know this because four bees came into my home to inspect the pot last week during Kumquat Marmalade Number One. Mom sliced, I chopped, and only a little while later we were ladling marmalade into jars and canning them in my big red pot. The same day as the marmalade, I baked off the MOST beautiful loaf of sourdough I have ever made. If I didn’t think it was obnoxious, I would have typed all of that in caps. I mean, beautiful. So, as my mom was leaving, after all her hard work of picking out those dastardly seeds from inside a tiny citrine fruit, I offered her my best–my most beautiful. Plus a jar of marmalade. She taught me how to share when I was just a wee one. And here I am, still working on it in her midst.